KEY FACTS: Neil Armstrong was born in Ohio, USA. He developed a love of flying from the age of 2 when his father took him to an air show. He earned a student flight certificate when he was 16yrs old, before he had his drivers license! He was an active boy scout and went on to earn the rank of Eagle Scout. Armstrong studied aeronautical engineering at university and spent some time as a fighter pilot for the navy. in 1962, Armstrong applied and was accepted onto a NASA astronaut program. He famously travelled into space on the Apollo 11 mission and was the first man to walk on the moon. 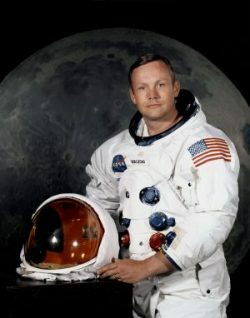 ACHIEVEMENTS: Armstrong will always be remembered as the first man to walk on the moon. He was awarded the Presidential Medal of Freedom, the highest honour a civilian can earn from the US government. He is also known for working as a professor of aerospace engineering.